The society was founded in 1992 to promote the study of local history in this part of Huntingdonshire. We have speakers from around the area presenting general local history topics. Refreshments are available during the evening. Visits to local places of historical interest are part of the programme and occur at a weekend 2-3 times per year. Transport is usually by car/own transport and shared where possible. There is also an Archaeology group which is a sub-group of the Warboys History Society. The programme for the year is available in the library and below is the 2019/20 programme. A reminder of the programme for the Monday meetings is distributed throughout the village at least a week before the meeting, and is displayed in the local shops, notice boards and in the library. 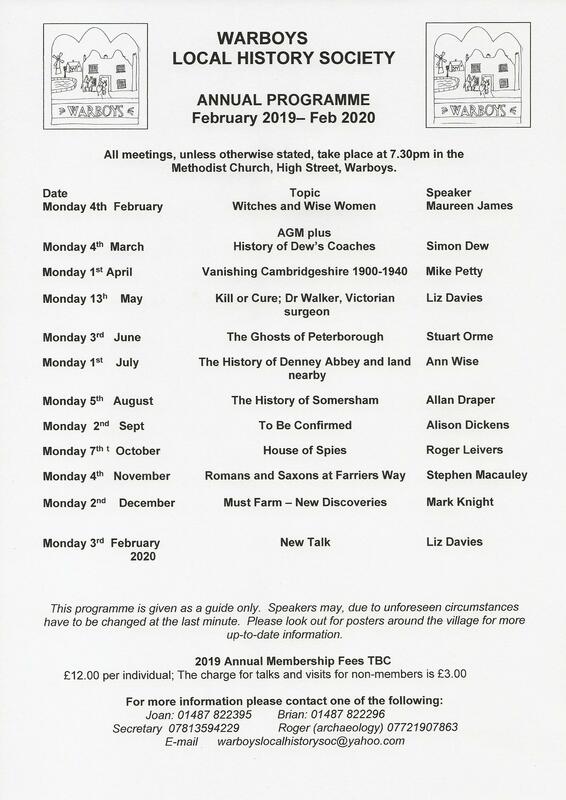 To browse the Warboys History Society Documents Click Here A password will be required. To print the details of the central panel click HERE it will open in a separate window, then print normally and use browser return button to return to this web page.